You’ll probably have heard of Wayne Courtney round these parts, since he’s Roath’s best organiser of fun – and fundraising – events: Roath Rocks, Rock 4 Life and The Great Roath Bake Off, to name three. 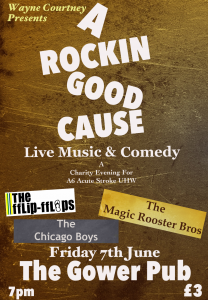 We say three, but within each group of events, there have been many live music gigs and community goings-on, each raising money for charity as well as being fantastic nights out in themselves. In fact, during 2011 and 2012, Wayne has raised more than £20,000 for various charities, so we thought it was about time we interviewed him to find out how he does it and what motivates him. How did you start organising events in Roath? ‘I organised a fundraising evening in the Coffi House – I was a regular there even before I lived in Roath, and used to visit my friends here – and shortly after that, other people who regularly went to the Coffi House started to ask me about my friends and local contacts in the music business, as they wanted me to run events for them. I knew people mainly from socialising, and people were prepared to play for free both to help me, and to get exposure. The musicians in Roath have a love of playing, and there is always a good crowd. The whole operation is a finely tuned machine, and the combination of being able to give a platform to new artists, raising money for charity, and boosting the takings of the venues always brings people in.’How did things take off from there? ‘We call Wellfield Road ‘The Strip’, and it really started to develop in 2007 when Juno Lounge opened. It was exactly what the area needed, and quickly brought a new social scene to this part of Roath. Cafés have always been part of the mix here, from the Coffi House and Bentleys to Dolce Vita, and when Pear Tree opened as well, it really made the whole street the place to be. For me, the events started to come about only by word of mouth – through my friends, and the friends and family of the bands who were playing. Something that was so lovely about the early gigs was the different age groups who came, old and young: they were supporters of the artists and regulars in the venues. How did your profile develop? ‘I was associated with fundraising parties and music. 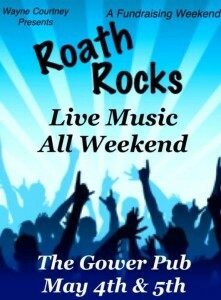 Long before Roath Rocks for example, I was raising money for small local charities and for wards in the hospital (UHW). The rise in social media use meant that I could see how much people were talking about the events, and it made it much easier for me to publicise them. That’s when I started to have no time for anything else! It was a break from the traditional way of fundraising: my events didn’t look like those, and were more unconventional. Most of my fundraising has been achieved through my social media presence, and that of the events themselves – being able to advertise to so many more people who then come to the events.’You’re a tireless organiser, aren’t you? 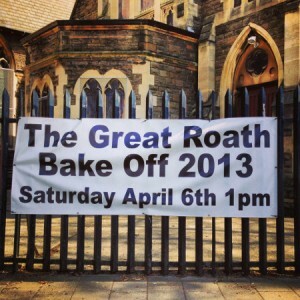 Tell us about The Great Roath Bake Off. ‘The success of the Bake Off is 99% due to Twitter. The first one at The Coffi House in 2012 was standing room only, and unfortunately, people had to be turned away. I ran another as part of Made in Spring 2012, which was great, and this year I knew I had to secure a bigger venue. The 2013 Bake Off, held in St Andrew’s Church Hall, was amazing. Around 600 people attended throughout the day, and there were more than 100 entries: 97 in the general category, 15 in the children’s group, and also 20 professionals. I was expecting 40 cakes!’What do you think the impact on Roath has been? You’re a bit of a Roath phenomenon now – how does that feel? 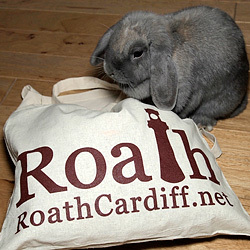 ‘I just love being a part of the Roath community! For this year’s Bake Off I wanted to include everyone – charities, musicians, independent businesses with stalls (and RoathCardiff!) and really to make everyone a winner. Proceeds that day went to St Andrew’s, Scope, MacMillan Cancer Support, and small businesses, so I feel like I achieved what I set out to do. Do you think this would have worked in any other area of Cardiff? So let’s get to the nitty gritty: how much have your events raised, and who would you like to thank? ‘I put on 24 gigs in 2012, and raised £12,500; and from events in 2011 I raised over £8000. 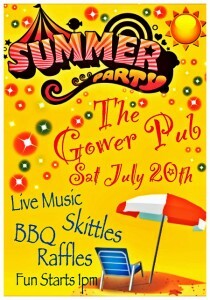 The Globe has been very generous, and The Gower management have really put themselves out for us. They’ve opened a new room there for the events as well. We’ve had after parties at The Globe and Pear Tree, and also KL Canolog is hosting an acoustic gig for us. Andrew Plummer deserves huge credit, as he’s printed all my flyers and posters for free, and saved me thousands of pounds. He’s from Roath, and comes to everything. We just met in the pub! It’s incredible what the shops in Wellfield Road have given me. The way I think, if I can help someone I will, and if they can help me, they will – I’ve got no agenda. 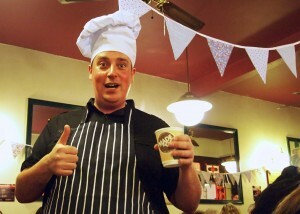 Thanks Wayne – you’re a Roath superstar, and we wish you the best for all your future events in Roath. Follow Wayne on Twitter here, and Facebook here. wayne courtney is a legend he is selfless he has a huge personality an is loved by everyone who knows him, i am proud to call him a friend.